Set aside the won-loss records. They don’t matter when it comes to the Week 3 game to watch in Utah high school football. Friday night at Hillcrest High School, the football teams representing two schools where lives were changed by a great man will take the field in his honor. Cazzie Brown, the 43-year-old head coach at Hillcrest passed away unexpectedly Sunday night after a brief illness. In the 18 months he was the Huskies’ head coach, Brown’s most important message was “One Pack” as he stressed the responsibility for students to look out for each other. Prior to being named to run the Hillcrest football program, Brown was an assistant with Brody Benson at Highland and the two are incredibly close. Friday night, it is the Rams who visit Hillcrest and it will be an emotional night for both teams. The squads shared a pre-game meal Thursday night, and when they enter the stadium Friday, it will be two-by-two, one Highland player alongside one Hillcrest player as they emerge from Husky tunnel. The players on both teams, as well as other football teams throughout the state, want to honor the happiness Brown got from football and what the game offers young people. That makes what happens at Hillcrest Friday night the game to watch and it really doesn’t much matter who wins the game. 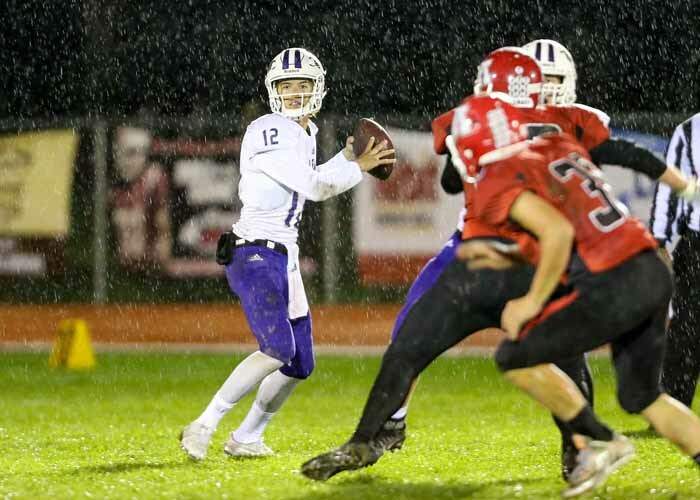 With Lehi playing this season in Class 5A and Lone Peak in the new 6A classification, this is no longer a region battle, but it does have the makings of a good one. The Knights come in off a loss to Dixie a week ago, while the Pioneers have won a couple of close games. Lone Peak knows the score – it has to find a way to contain Lehi quarterback Cammon Cooper, who has a great working relationship with wide receiver Kade Moore as well as tight end Dallin Holker. Mix in a little running game from Carsen Manookin just to keep the defense honest and a veteran offensive line and you have all kinds of matchup problems. The constant for the Knights in recent seasons has been defense and they are working to reload in that area, but as they do so, their offense has been very good so far. New quarterback Brock Jones and running back Kobe Freeman bring the run/pass mix Lone Peak likes and this feels like a game in which points will be scored. Led by MJ Tafisi, the Hawks found the defense last week that was lacking in Week 1, but this week brings a whole new challenge. Cammon Cooper put up record-setting passing numbers against this defense in the opener, but he is more of a pure passer. Taylorsville may have the most dynamic dual-threat quarterback in the state in Dane Leituala. While Alta contends with the running and passing of Leituala, its offense will look to quarterback Will Dana to put up big numbers along with running backs Tu’u Afu and Zach Engstrom, and the speed of London Rockwood on the outside. It’s an intriguing matchup. Trace Tupe and Kyrese Rowan provide a pair of explosive options for the Royals, with Tupe having taken two kicks back for touchdowns in the team’s first game of the year. Roy is always a high-effort team and that has not changed, but in this one they will deal with explosive two-way signal caller Jayden Clements of Skyridge, a team with a special teams threat of its own in Alex Palmer. The Vikings do not want to drop to 0-3, and coming off a dramatic loss in Week 2, this is an important one for Pleasant Grove. Speaking of close games, Jordan won its opener in dramatic fashion and lost Week 2 in equally sudden manner. The last few years have delivered classics when these two teams meet, so factor in the way things have gone this year and you can probably expect some fireworks Friday night. While most of the state is still figuring things out in non-league matchups, this is one of three Friday night contests that open Region 1 play. Carter Green had a big night running the ball a week ago as Weber leveled its record with a win against Roy that puts it in a good position heading into this one. The passing game, with Jaxon Mansfield completing passes to Justin Brown and Colton Manning, has brought life in Clearfield. Now, region play will show if it is for real and this is a team that wants to send a message that it needs to be taken seriously. The Bengals are off to a fast start as they try to wipe away the bad taste of last season. Now, they travel to play an Olympus team that has been piling up points like crazy through two season-opening wins. That will be a test for a Brighton defense that looks strong, led by Sione Angilau, Salua Masina and Brooks Johnson. The Titans have been doing a lot of damage in the passing game, and against this defense, that will only happen if they can protect quarterback Harrison Creer, who has tossed five TD passes in each of his team’s first two contests. Coming off a huge win over East, the Miners look to be as powerful as ever and that may be bad news for a Herriman team that would love to avoid and 0-3 start. The Mustangs opened with a loss to Lone Peak and then travelled to Southern California and were shut out by Helix. Expect them to come out firing against Bingham, but that may not be enough. Braedon Wissler has been a revelation for the Miners, who always seem to have great depth at running back. Wissler went for 160 in Week 1 and backed it up running for 190 against East last Friday night. As usual, Bingham dominates the line of scrimmage on both offense and that defense may have given up some yards to East, but it does not yield points easily. The Leopards don’t believe in taking a scheduling break. After opening with a blowout win at Timpview, they took a bit of a beating last week at Bingham. How do they recover? Week 3 takes East to Arizona to take on a Saguaro team that has spent most of its time as one of the top two or three teams in the Grand Canyon state during recent years. Last year, the Sabercats were a Top 50 national team. Maybe playing another powerhouse team is just how East gets itself back on track. As they usually do, the Leopards will rely on dominant line play on both sides and they will pound the ball with that vaunted triple option. Sione Molisi has been the workhorse back so far and he is coming off a 228-yard game in the loss to Bingham. The Thunderbirds seemed to discover their offense midway through last week’s come-from-behind win over American Fork. Now, they will be tested by one of Northern California’s most consistent programs. Located in the foothills of the Sierra Nevada mountains, Del Oro has built a consistent Top 25 program in the state of California and that is about where it is right now. After highly successful coach Casey Taylor moved on, Jeff Walters is in his first year running the Golden Eagle program but it looks very much the same – strong defense, a running game featuring multiple backs with a blend of passing. Timpview’s transfer quarterback, Isaiah Ramos, seems to be getting comfortable in this offense and working with his new teammates and this will be a good week for that to come into play. That is especially true for a team that is breaking in a whole new group of pass catchers. The contest is part of the Brothers in Arms Classic, featuring three Utah teams, being played in Southern California at Mission Viejo High School. American Fork plays Servite Friday night, while Orem takes on Bakersfield at 1:30 p.m. (MT) Saturday, followed at 5 p.m. by the Timpview vs. Del Oro clash. This one has interest locally as the Thunder take on a Mission Hills team that features quarterback Jack Tuttle, a University of Utah commit. Penei Sewell, Noah Sewell, Brock Parry and company will look to match points with Tuttle, while Carter Reynolds and the Desert Hills defense will apply pressure and try to break his rhythm.